I have two computers both running Windows 10 Pro and Synergy Version: 1.8.7-stable 64-bit. Main computer (server) has four monitors. Second computer (client) has two monitors. 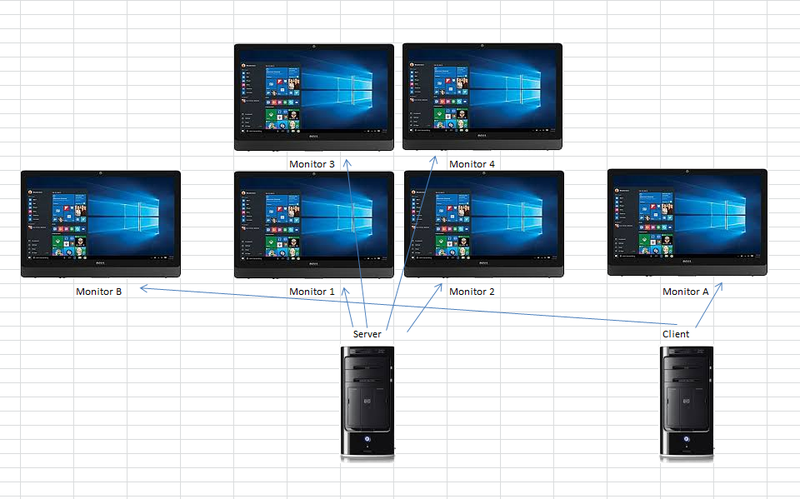 I would like to be able to configure the server/client configurations so that one monitor on client computer displays on the left of main computer monitors and the other monitor on client computer displays on the right of main computer monitors? Currently in order to move the mouse from Monitor 2 on Server to Monitor B on Client, I must first move the mouse from Monitor 2 to Monitor A, then drag the cursor through Monitor A in order to get to Monitor B. Again, I would like to be able to move cursor left from Monitor 1 to Monitor B OR move the cursor right from Monitor 2 to Monitor A.
I would also like to see more advanced screen configurations available on the server. Working with 4 displays in an inverted 'T' shape using 1 sever and 2 clients. I just downloaded Synergy yesterday and I love it so far. I can see it boosting my productivity by a large amount once I get used to it. I sent an email/chat to them about this very issue so consider this my +1 for this issue. I have a gaming/dev laptop with my high powered apps and a business laptop with my productivity software on it. Both have a second monitor when I am home, but when I am on the road I only take the second monitor for my gaming/dev system. So when we go to configure the server and are on the screens and links tab we should be adding something like GameOn1, GameOn2, Work2 and Work1 where Screen 1 is the laptop and screen 2 is the extended screen. There would we an extra setting in the configuration of that screen where we choose the number of the monitor so that the naming does not impact the selection any more. Choosing screen 0 would combine all the attached screens as one display. Once you configure a screen you should be able to disable it or pick it from a list instead of having to recreate it every time. I see how this is not exactly the same as this issue, so I will be adding a new topic for the different requests. Hi @Ed Gorth. Sorry for the late reply. That monitor setup is not yet supported. There's a lot of feature request already submitted that has the same idea as you wanted to have. Currently we are still focused on making Synergy more stable for cross platform support. Although we will definitely find ways for us to support this in the future. Please bear with us as we try to make Synergy even better for everyone. Thank you for replying. I look forward to using this feature when it becomes available in your excellent program (Synergy Pro), which I use daily. You're welcome @Ed Gorth. Thanks for understanding it as well. We hope you'd be there when we finally announce the release of v2.